Please contact Mike or Jessica by phone or email to check availability before making a booking. 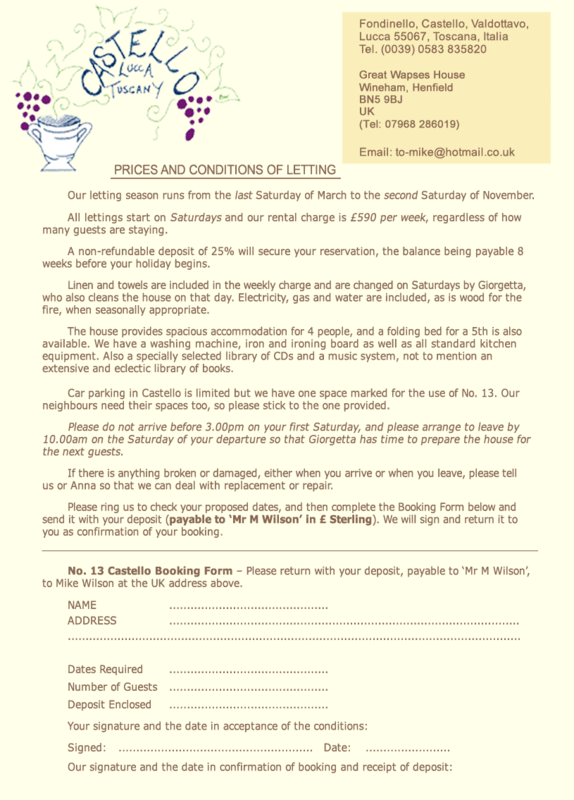 We like to receive a hard copy of the booking form by post for our files, and so that we can return it to you with our signature. Ideally your sterling deposit will accompany it in cheque form, although we can help you to make an electronic payment to our bank if this is helpful. Recommended: A Word file with the booking form (which should be printed out and then filled in by hand) is available here. A .PDF version is here. An image file which can be printed out by your image-viewing software is available here. You may have to resize this, using your image software, to fit the piece of paper (this has been done for you in the files in the first option). Or, below this list is a smaller image of the booking form. You may be able to print this out using your browser and then fill it in.